B U B B L E G A R M: My Hair History..
Born with light brown"ish" hair, with an ever so slight curl which dissapeared as the years went on. I supported various peculiar looks and even cut my own hair numerous times. I had a musroom bob which was the funniest, a bent fringe and spectacular updoes that I insisted I needed for a trip to the park. 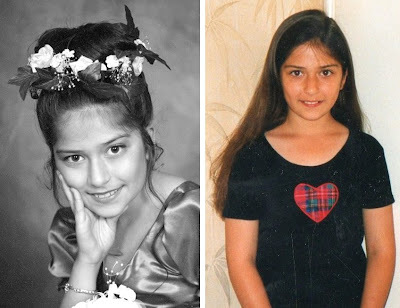 By the age of 10 I had really long hair down to my lower back, it got darker and straighter. Me and my mum later decided it was time for a change and I had my hair cut into this short bob, it was a drastic change but I loved it! 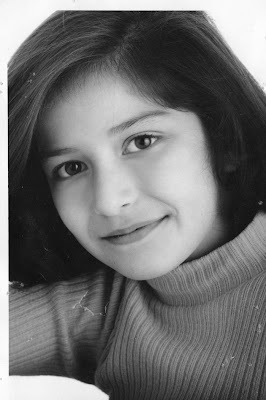 This photo is from my modelling portfolio as a child. I soon went back to being "normal" when I started uni, I ditched the contact lenses and re shaped my eyebrows, however, the length of my hair remained the same, due to regular trims because of heat damage! 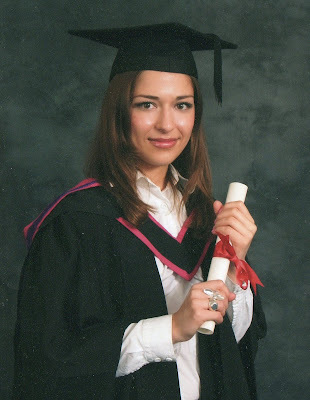 Below is a photo of me on my graduation day - June 2007. A much deserved holiday afterwards, and yes.. I still have the same hairstyle. 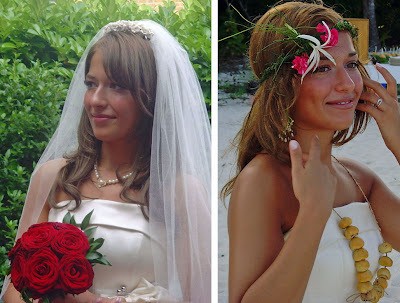 I got married last year, for my London ceremony I opted for darker hair and some clip in extensions, and as for my beach wedding... well I ditched the extensions and my hair was ALOT lighter thanks to the sea water. On our honeymoon, my hair continued to get ridiculously light.. I soon sorted that problem out and dyed my hair dark again as the lighter tones in my hair really looked odd with a tan. But, I soon went back to my lighter shade of hair and supported the sew in extensions. You will have to wait for my fotd to see what it looks like currently. As you can see for about 7-8 years I have had mid length layered hair which I love but it gets boring, I have the urge to cut my hair into a layered bob, short like a boy, then I also have the urge to grow it really really long so I don't need extensions too. I'm just a whole big pot of undecisiveness! you look stunning in every picture! you can get away with almost anything! mashAllah you have lovely hair!! btw I love your new template, very fresh and welcoming. anyway, I love you new layout, it's cute. aww look how cute you were! (and still are lol) I'm really loving the darkest hair color now that I see them all...I also went through the overplucked eyebrow phase...didn't we all? I am just like you when it comes to hair...I love long, but whenever I see a really cute short haircut I'm thinking "omg that's so cute, and probably low maintenance too!" wow you look so amazing in every picture. was that when you started to get into make up? Omg you were a CUTE little girl! SO ADORABLE. Honestly I am LOVING the dark look you are sporting now, so sultry and smokey! hot! Wow, so many changes.. I went through the same thing ! My hair & eyebrows altered throughout the years.. haha. Those were the days. Love the pictures. Thanks, for sharing! lol arent we all kinda undecisive when it comes to hair. when we have short hair, we want it long and when we have it long we want it short! love the hair in all pics! i actually REALLy love the look ur sporting these days, u look so gorgeous and natural! These are lovely pictures! I have just started blogging after i got bored of Polyvore (you were on my contact list and i use the name Ariah). 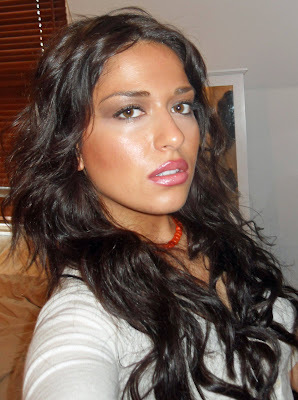 I have added you on my favourite blogs and hope to learn a thing or two about makeup! You look lovely in all the pics,escpecially with your dark hair! Dont cut it as you will regret it! i always had short hair and I can never go past the awkard stage and grow it longer. I have experimented so much with my hair, that you wont believe what i have done to it, if i tell you!!! But do keep the length , it looks gorgeous with the extensions! @karen wow thank u :) well, yes at 14 i started wearing mascara, then at 15 introduced to lipgloss and then at 16 i was in love with cream blush! i only started wearing foundation after i got married as my skin went crazy. and up until 6 months ago i never even wore eyeshadow :) hows that? @belledujour thanks hun, ur way too kind! wow i loved this post it's always so interesting to see how ppl change their hair. and i agree with sweetistsinsheron you look like a different person with the blonde hair/tan/contacts. wow what a difference hair can make! i think you should grow out ur hair, because even though i do have those phases where i want it shorter because it's easier etc. it's so much more fun and sultry to have long hair. plus it suits u a lot to have longer hair. when u first dyed ur hair dark u reminded me a lot of megan fox. bombshell! @glitteringpixie wow thank u so so so much for ur kind words :) I think when I take the extensions out I will get a trim and then take major care of it and grow it out! You are seriously photogenic woman dammit!!! Yep gorgeous all the way through! What ethnicity are you if you don't mind me asking? do you have your sew in extensions right now? im thinking of replacing my clip ins with sew in but can you swim with them in? @monika thank u, i'm Turkish..
i LOOOVE it long and dark in the last one!